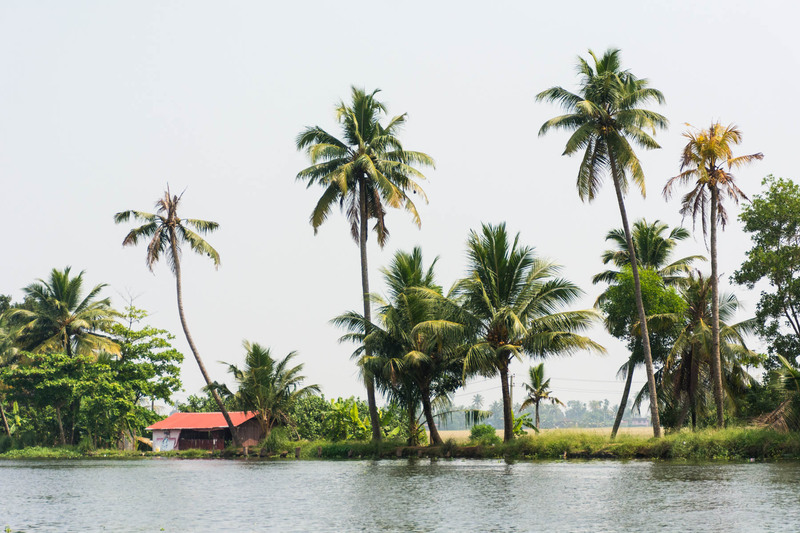 The backwaters of Alleppey (also known as Alappuzha) are a common stop on many a tourist’s trip through Kerala, India. 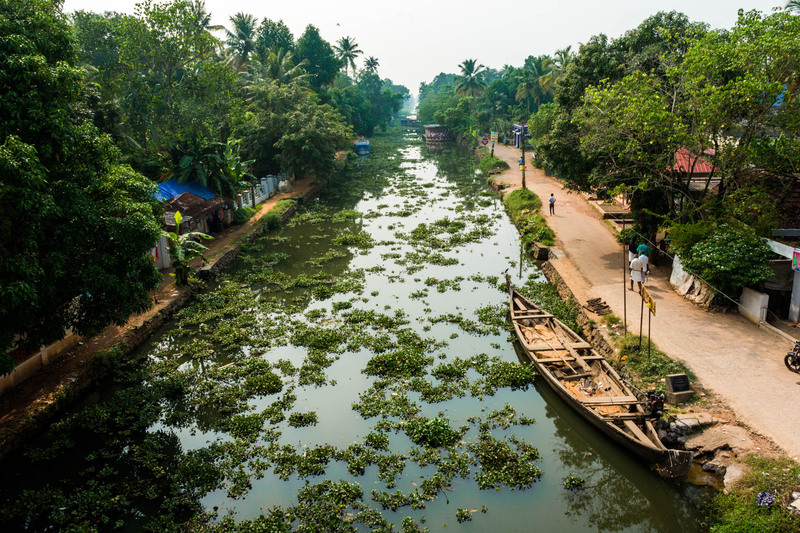 Here are photos to prove why you need to go and visit Alleppey, and a tip for the cheapest way to see the Alleppey backwaters in Kerala, India. No expensive boat hire required! Ah, Alleppey. 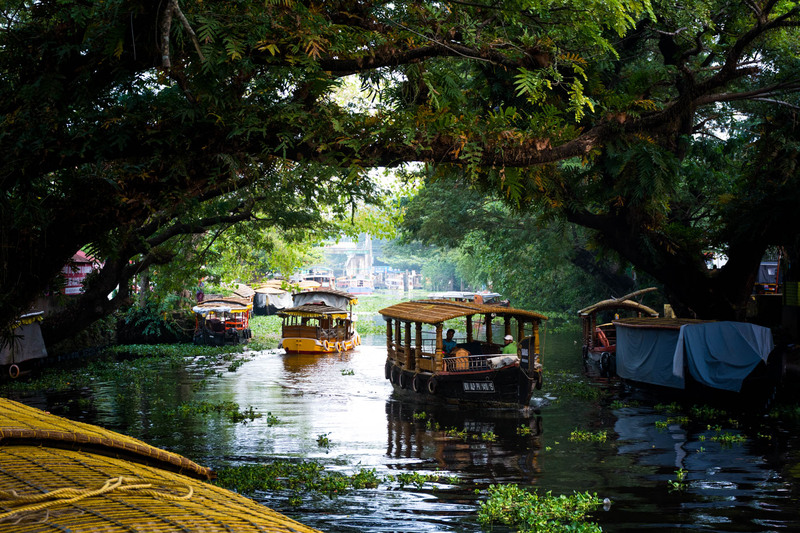 Its winding waterways and palm-shaded streets are a sight to behold… and it’s no secret! 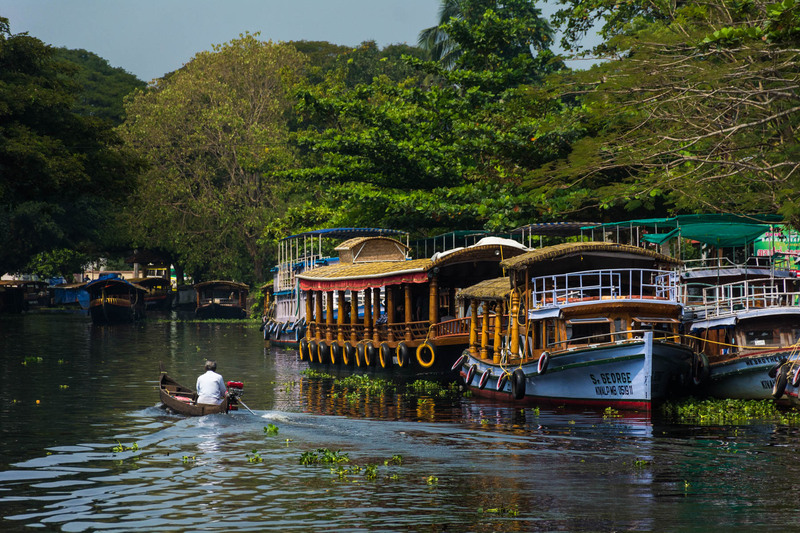 Alleppey is one of the most popular spots for those looking to explore Kerala’s famous backwaters. 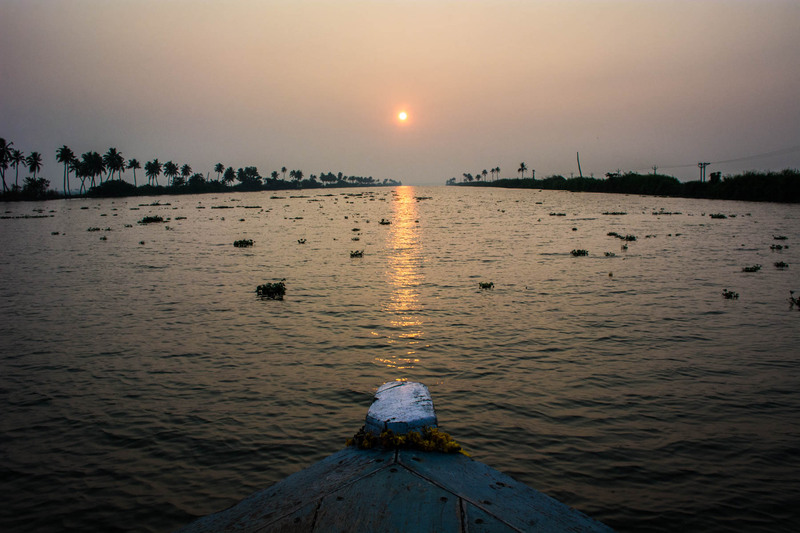 The most common way to see Alleppey’s backwaters is to hire a boat for one to four hours, sometimes more. 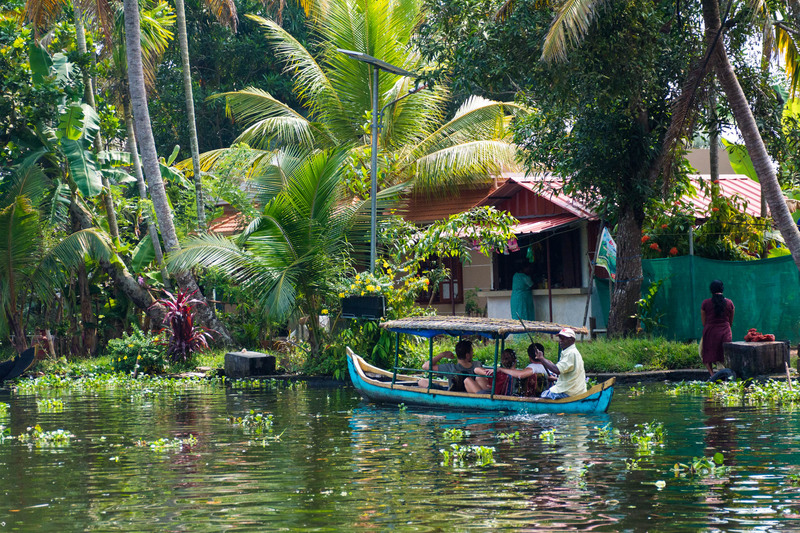 A motorboat trip around the backwaters and to several small stops can cost anywhere from 1,200 Rs. 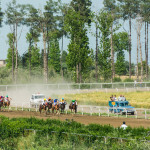 total ($18) for a few hours to 2000 to 3000 Rs ($30 – $45), depending on the season. And if you want to live it up, you can even stay on an Alleppey Boat House, with all the luxury that this entails. This all well and good for groups, or those on a bigger budget, but what about backpackers and budget travelers? 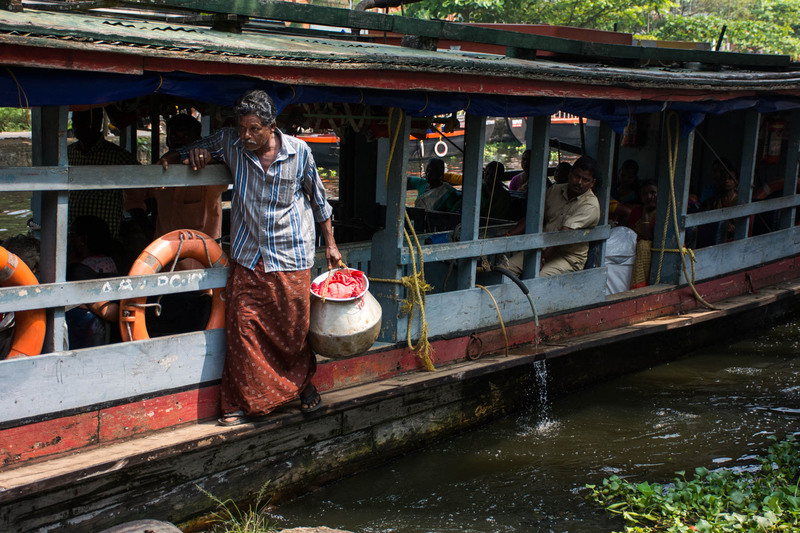 If, like us, you’re not too picky about stopping for touristy “village tours”, there’s a super cheap way for you to boat on the backwaters of Alleppey: the local ferry system. The region has an extensive network of ferries that carry residents up and down the rivers and canals throughout the day. 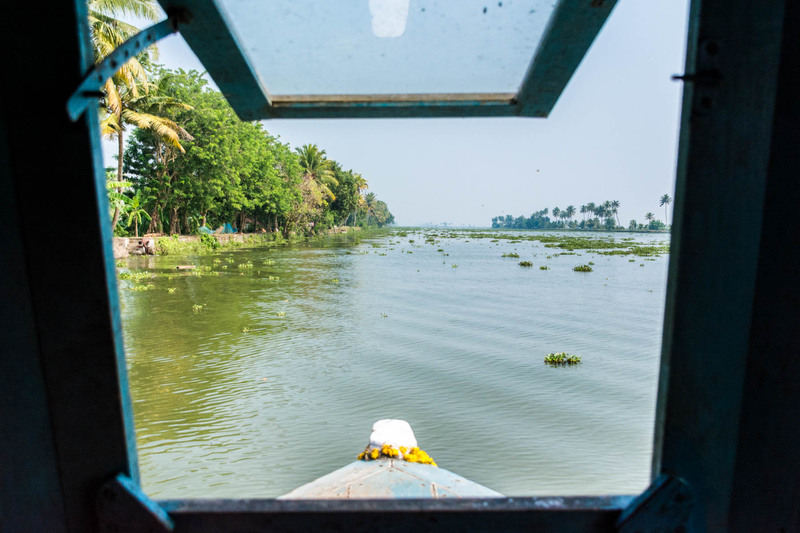 Given Alleppey’s problem with pollution from the tourism surge, mass transit is a great option to see the backwaters in a responsible way, and it won’t break the bank, either. 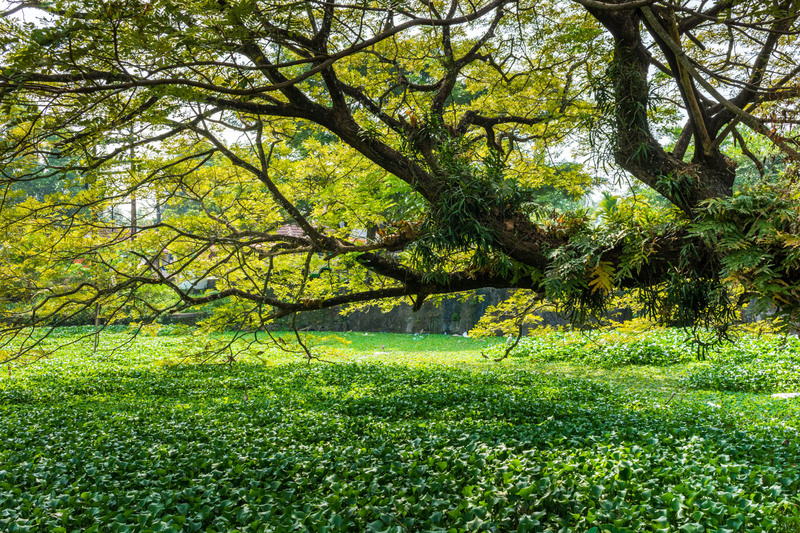 Looking for more things to do in Kerala? 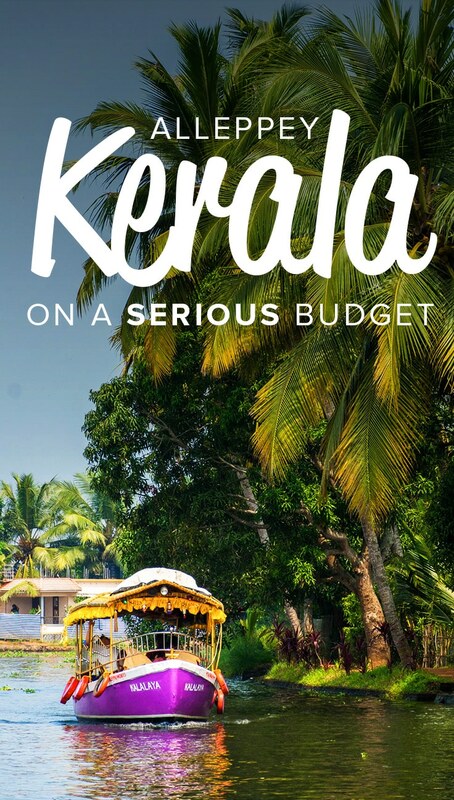 Check out this article on places to visit in Kerala! If you want to play local, be a bit more sustainable, or just save yourself boatloads (PUN!) of money, this is the way to go. 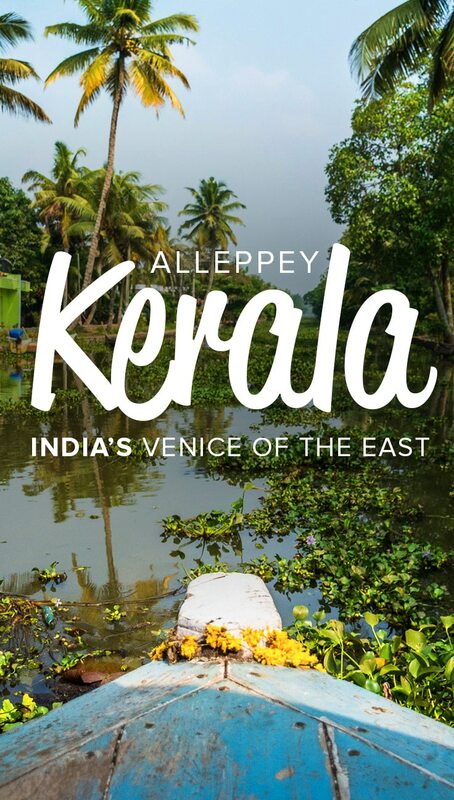 Where do the ferries around Alleppey go? You can find a ferry schedule on the Kerala government’s State Water Transport Department (SWTD) website. 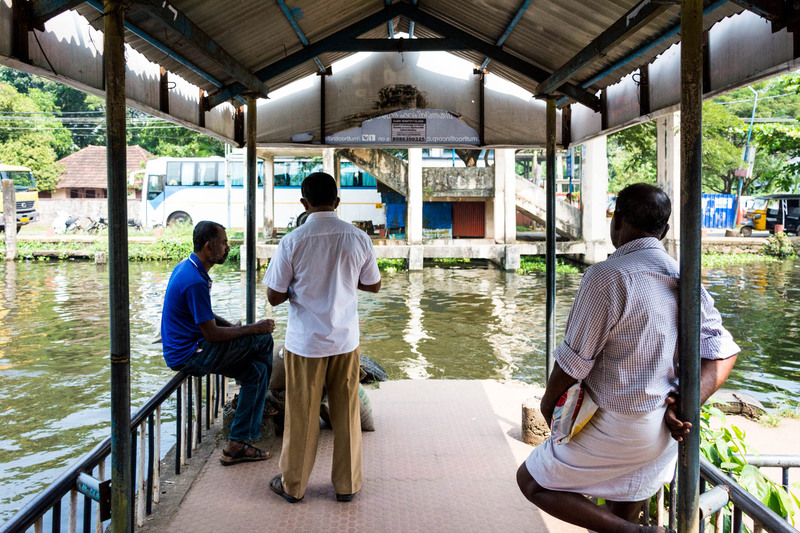 Basically, boats go to and from the ferry jetties in Alleppey until about 21:30. A schoolboy drawing on the evening ferry. There are several locations serviced by regular ferries all day: Nedumudy, Kottayam, and Krishnapuram. 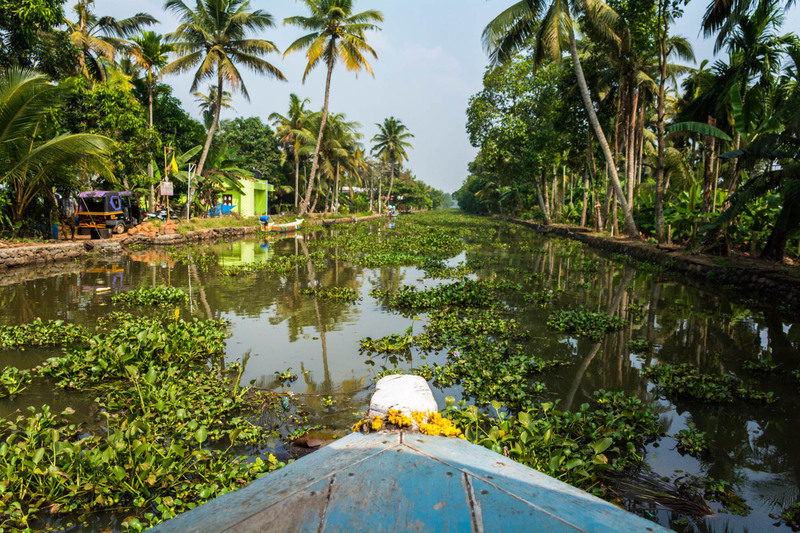 These are your best bets, as you can be assured there will be a boat back to Alleppey as long as you don’t leave too late in the day. 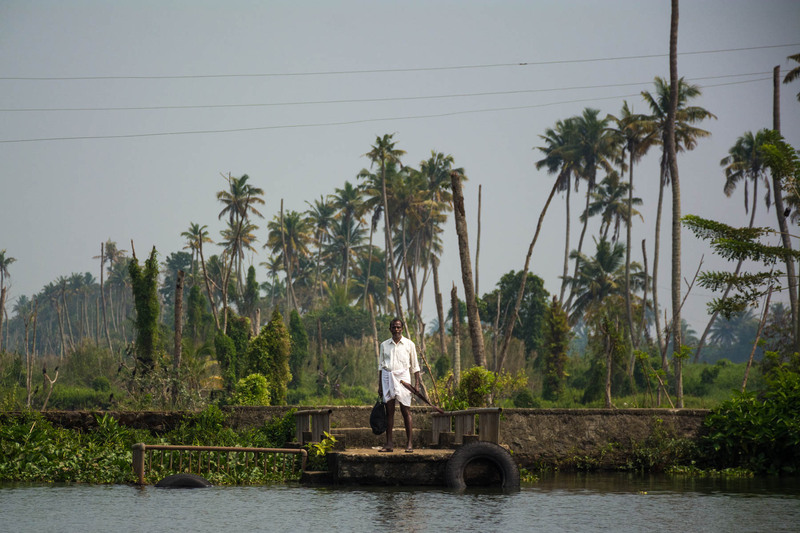 We took the route to Kottayam, which goes over the lake and ends halfway up a waterway to the town next to a school. The ride took 2 hours in one direction, and a ticket was 33 Rs. ($0.50) per person round-trip. The ending point was definitely middle of nowhere status, so if you want to get to Kottayam town, you’ll need to hire an auto from the jetty when you arrive. The ending point for the Kottayam ferry. 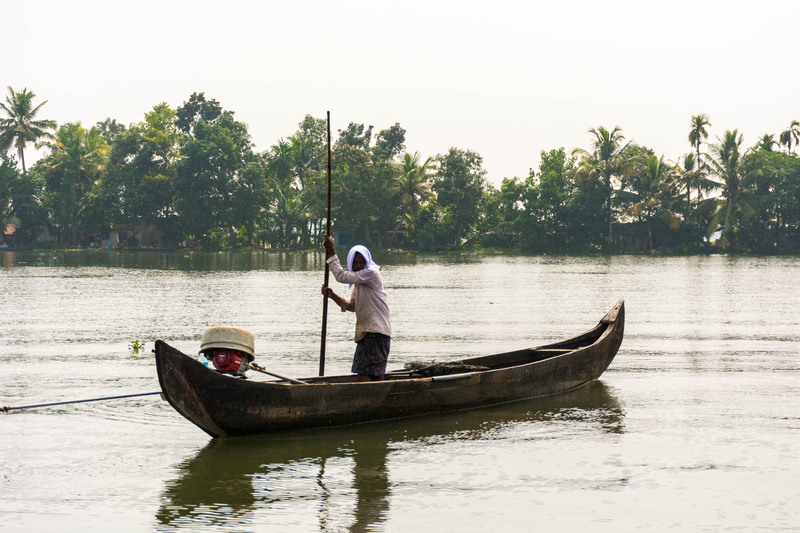 A fisherman on the lake near Alleppey. There are a lot of wide waterways on the way to Kottayam. The route to Nedumudy goes through more winding waterways, which should be more scenic. It’s a bit closer to Alleppey than Kottayam, so it’s a shorter route, but potentially more lush and scenic. Can you believe there’s water under all of that green? Krishnapuram is a long ways away from Alleppey—about 8 hours. We recommend bringing your bags with you and staying there if you take this route. One of many tiny houses along Alleppey’s waterways. 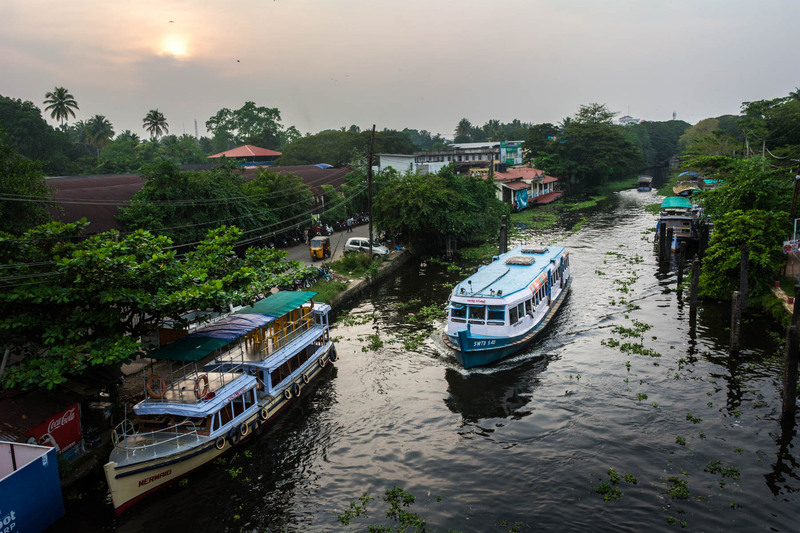 To find the Alleppey (Alappuzha) boat jetties, check out the map above, or just hang around on one of the small boat jetties on the main canal through Alleppey. The ferries will stop at any jetty, as long as you wave them down. Make sure to ask where the ferry is going before getting on. The locals will be happy to point you onto the right boat. The same goes for getting off the ferry. Jump off wherever you’d like (even into the water, if you so choose), all you need to do is point to where you want to get off. Talk about hop on, hop off! Bringing water and snacks is always a good idea for long trips. 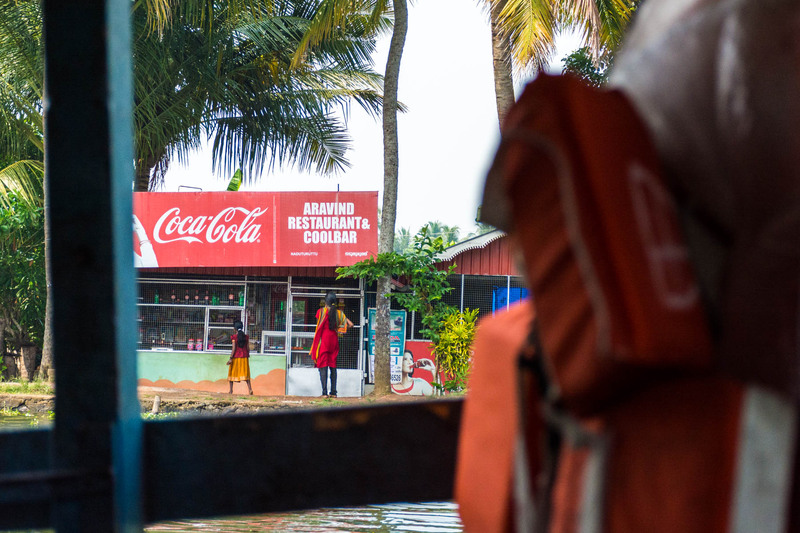 However, if you’re looking for a bite while on the water, there are a decent number of tiny restaurants situated near boat jetties along the waterways. Just point one out to the boat hands and tell them you want to get off there. You’ll have to wait for a new ferry to continue on in your journey, but there are plenty of boats running up and down the main waterways. Punting boats are another cheap/responsible alternative to motorized tour boats. Just don’t make them row you too long! It’s wise to book ahead in high season (December-January), as Alleppey is super popular with local and foreign tourists alike. Kerala is one of India’s hottest destinations, after all! We stayed in Monkey Republic guesthouse, and it was cheap and good value: free breakfast (with coffee) and wifi that actually worked—amazing for India! You can book Monkey Republic here. If that’s full up, check out Lotus Homestay. 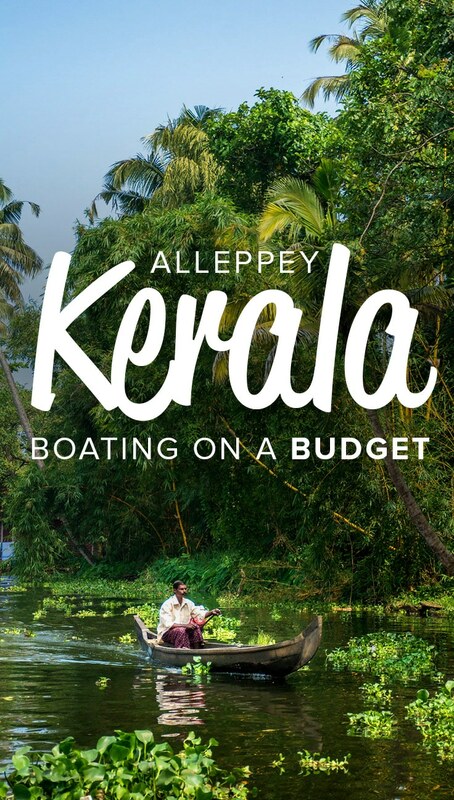 And there you have it, our guide on visiting the backwaters of Alleppey on a budget. Let us know in the comments if you have any questions. In Kerala? Don’t miss experiencing a Theyyam ritual in northern Kerala! Yay transparency! There are affiliate links in this post. If you book a stay with one of our links, we’ll make a small commission at no extra cost to you. Never fear, we only recommend places we’ve used or would use ourselves. We’re good people, we promise! btw have you ever experience some bad treatments especially as a woman while traveling in India? as we heard recently on the news that nasty things happened (again) to an American woman tourist and some other before hand. Need your insight for traveler to India as a safe solo woman destination. ? Yeah, I’ve been touched several times, and had a bunch of men surround me once. However, I think overall people in the south of India are quite friendly and relaxed as a whole. Can’t speak for north India yet, as we’ve only seen Delhi for a couple of days. But, that’s not to say women shouldn’t travel alone in India! Women do so all the time. It depends on how much you can tolerate, and of course precautions need to be made, just like traveling alone in any other country. Don’t walk around late at night alone, don’t be too friendly towards men you don’t know, don’t go off with men alone, etc. The good thing about India is there are many places where finding a traveler companion for the day will be easy. It’s a popular tourist destination, and there are backpackers here year-round. Solo girls included. Thanks for letting u know. Thank you for having trust in India (Your reply to Etaporama). In a country with 1.3 billion people, there may be one or two such incidents. But one incident cannot decide the nature of a whole country. There is also a good side of the country; locals heartily welcome guests, backpackers always willing to help foreign travelers, cab drivers try to communicate in English even though they find it difficult to speak, first preference to foreigners in banks, restaurants etc. On a whole, we love to have international travelers here and exchange culture with them. P.S: Alex, hope you travel to more places and post their stories here. I would love to read them. That’s what many people seem to forget (or willfully ignore). We definitely fell in love with India, and safe for a few creepers here and there hardly had any problems. And what you say is true, people all over the country treated us extremely well and always helped us out when we looked lost. We’ll be back soon! Lovely, i took many valuable details from here for my tour on December 2017. Hi, glad you liked it. No, we haven’t been on any wildlife tour. Everything’s sooo green! Great photos you’ve taken there. Thanks a lot Alex for the valuable information. I bet I couldn’t have found it elsewhere. If my visit is a success, will surely link to this post.